Manon was on the climate march on the 8th, then stayed around for the Gilets Jaunes. Her and two friends were walking away from the city-centre at the time. The only indication she had been protesting was that she wore her nurse’s coat and was carrying a first aid kit. When she was shot, the protest was over and there was no crowd. She’s not even entirely sure where it came from, only that it hit her in the foot. Such is the nature of the flashball that the possibly accidental shot fractured her metatarsal. She has filed a complaint, and has been forced to go on sick leave until early February. To be correct, that point was part of his election platform, so it is not a reaction to the protests. But I agree we will see more leaderless protests again other rudderless politicians. The two photographs here are, really, all one needs to ‘read’. The CRS-SS slogan developed largely out of CRS attacks on students, whom the CRS could easily warp into an Other before bashing their heads in. But the Gilets Jaunes seem to be from a social base that must overlap quite a bit with that of the CRS. I hope that some enterprising and maybe necessarily courageous soul can do some interviews to see what the cop rank and file thinks about this. This is why United Statesians will never take up the Yellow. Rather watch someone else get trashed…Here; the people would rather not see it coming. The Gillet Jaunes got balls. Say what?? Protesting Americans have faced down police who act with true impunity and are decked out in full tactical military gear. In particular, the early days of BLM. The ant-War, the Civil Rights and the Free Speech Movements all got a lot of police, and even some civil, violence in the 60s and early 70s. And the Union Movement always got police and company “security” violent and sometimes lethal attention before then. Actually from the 1850s to the early 1970s there were frequent protests, and often violent responses. Punctuated with the occasional peaceful time during war. It is really difficult to get 40 year olds to protest. It takes a concerted effort to break down the structure of their lives to put them into the position where they will do it. Historical examples I can think of include the American Revolution, French Revolution, Bonus Army in 1930s, civil rights movement, Trump campaign rallies, and recent Women’s Marches. Anti-Vietnam War and environmental protests of the 60s tended to be younger generation. Big ongoing protests of middle-aged crowds indicate that there is something fundamentally broken in society. Otherwise, they would be working their day jobs, looking after the kids, and generally trying to enjoy life. When was the previous time that she took an entire day to go to a rally? It takes a powerful undercurrent to get people this age to re-allocate time to something like this. Many violent demonstrations don’t start out violent. They start out as “field trips” and end up with violence. A handful of rabble-rousers and grumpy or scared policemen can completely change the day. Not sure Europe (or the US) has any leaders. There’s ever so many people wielding power, and yet none of them seem to be leaders. Systems haven’t continued to collapse. People working day in and day out keep the systems going. Shouldn’t the French guards be taunting and hurling livestock? diptherio – you made my day. wow. I used to say I wanted to be reincarnated as an irate French farmer with a high-tech manure spreader – now I just want to be reincarnated as French anything. If little Manu Macron – the gilded turd – wants to save France he’s gotta start eating it fast. Like a contest to see how many hot dogs you can eat in less than one goddamn minute. Neoliberals are using every trick in the book to try and make it look as though their ideology is working. Germany is seen as a great success story, but just scratch the surface and what do you find? “Germany is turning to soft nationalism. People on low incomes are voting against authority because the consensus on equality and justice has broken down. It is the same pattern across Europe,” said Ashoka Mody, a former bail-out chief for the International Monetary Fund in Europe. Mr Mody said the bottom half of German society has not seen any increase in real incomes in a generation. The Hartz IV reforms in 2003 and 2004 made it easier to fire workers, leading to wage compression as companies threatened to move plants to Eastern Europe. The new mini jobs seem to be a big part of it and 94% of jobs created by Obama were part time. The minimum wage is specified at an hourly rate, so a part time job doesn’t pay a living wage. They can then say how low unemployment is, and the UK is using this cover story as the UN inspector found when he came to investigate our problems with poverty. There has been a general manipulation of statistics to make things look much better than they actually are. Poor old Macron was the first to pay the price, as French policymakers had no idea that wages weren’t keeping up with real inflation until the “Yellow Vests” hit the streets. This story is a bit misleading in several ways. National service (basically a few months of largely civil activities) is an idea that has been discussed a lot and did not originate with Macron. The hope is that it will restore a bit of social mixing among the young. It has nothing to do with the gilets jaunes. Beyond that, with incidents all over France every day it’s hard to know what to think. The police do not have the equipment to deal with small groups and they are forbidden use of lethal weapons. The problem is that this has been going on for so long now that so called ‘non-lethal’ weapons, which are only relatively not absolutely safé, are bound to result in some casualties eventually . There is no repressive policy as such: that would be political suicide and anyway the forces are simply not there to implement it. But there are a lot of tired, angry and sometimes frightened policemen, some stupid or violent GJs and a lot of scope for something quite serious to happen. The main effort of the government is propaganda – painting the GJs as fascist troublemakers. But it’s not working. “are bound to result in some casualties eventually”? Nothing wrong with that, is there? Just a bit o’ sport. Funny, that, actually. Couldn’t blame those innocent bobbies, now could we? Go on and change the telly before there’s any more blood. Supposing you wouldn’t much agree with reversing your subjects to read, “But there are a lot of tired, angry and sometimes frightened GJs , some stupid or violent policemen and a lot of scope for something quite serious to happen.” That almost makes me feel sympathy for the protesters rather than the police. Forswear! The other day I read a left criticism of the Gillets Jaunes for having almost no black/brown participants. As if, black and brown people live in small towns and rural areas in France or any other Western countries. And now I’m starting to hear that GJ is a Putin-backed attack on Macron. The corporatist spin never ends. Recall that the Wall Street toadie Obama and Bloomberg, the diminutive multi-billionaire Mayor of Wall Street…uh…New York, along with dozens of Mayors and Municipal officials across the country conspired with police and DHS goons to beat the living daylights out of the Occupy Wall Street protesters because of their “terrifying” rallying slogan: We are the 99%!! The Truth is kryptonite to all these lying, thieving political pimps & sharmutas and must be crushed by all dread means. May the Gilets Jaunes stand their ground against the Macron misgovernment and multiply!! What are some of the demands of the GJ? Our corporatist hollow media in usa never covers it with an nuance or depth. Are they claiming the same rights as we american need? May the Gilles Jaunet perpetuate and continue to swell and wax in numbers. It inspires many of us here in america! Rubber bullets are not supposed to be fired directly at people. They are supposed to be shot at the pavement and bounce into people. That is supposed to make them less lethal. why has no one brought these protesters cookies? Looks like we have not reached the ‘Let them eat cake’ moment. But then if the Yellow Vest can maintain momentum (ideally increasing momentum) with no let up we will get there one day. Civil wars take time to build up but the way the cabal of central bankers, banksters, politicians and corporate are going we will get one sooner or later. Looks like the Davos crowd will learn their lesson only when there is a civil war. 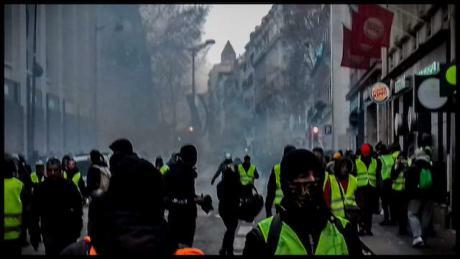 On the 11th consecutive weekend of action against the government, 69,000 people took to the streets, including 4,000 in Paris, the interior ministry said, down from an estimated 84,000 demonstrators across the country last Saturday. 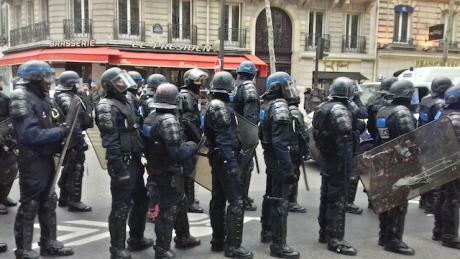 Marches were mostly peaceful but there were incidents in several towns, including in the capital, where an eye injury to a well-known “yellow vest” activist added to recent controversy over police violence. 1. Estimates of 69 000 and 84 000 of people on the street look like exactly the same thing to me at my computer table. Don’t know how to estimate numbers of people on the street and I don’t think the French interior ministry does either. Has anyone noticed that the average American protester would likely be bankrupted by the medical bills (despite any “insurance” that they might have) and taking even days off from work, forget about weeks, would likely make them homeless? It is weird to see accounts of people going to the hospital and not have them mention the cost, or perhaps bring up their new account at GoFundMe.